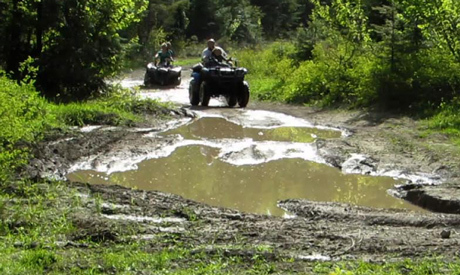 Illegal ORV mud-bogging in Krause Basin, May 2014! 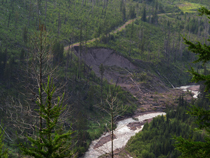 Please take a moment NOW and write an email to the Flathead National Forest, which wants to institutionalize and highlight ORV use of the wildlife-rich Krause Basin in its new draft Forest Plan! 2. The 1995 Flathead Forest Plan Amendment 19 finds that the Krause Basin area has more than twice the density of motorized routes allowed and only half of the grizzly bear security required by Forest Plan standards. 3. It is high time to close the ORV routes to motorized vehicles to provide adequate security for grizzly bear, calving elk, wolverine, and lynx. 4. These routes and wildlife habitat can better accommodate lower-impact uses by foot, ski and mountain bike that have become increasingly popular, while maintaining peace and quiet in the adjacent Foothills Road neighborhood. 5. The new draft Forest Plan’s Management Area 7 “Focused Recreation Area” emphasizing “motorized trails” is absolutely unacceptable for Krause Basin and contrary to the goal of limiting human uses to those that don’t trash wildlife security (as are Swan Lake Ranger District’s plans to illegally mark the ORV routes on the ground)! Click here to download a petition that makes the above points, sign it along with a handful of your friends and associates, then mail it to us at the address provided on the petition. The Forest Service has had 26 years to reduce ORV use and abuse to levels that protect fish and wildlife. Now it wants to head in the opposite direction and at the expense of lower-impact, quiet recreation! DON’T LET THEM! Click here to find more details on the history of legal protections for Krause Basin, on pages 4-6 of our 60-day notice of intent to file suit in this matter. PLEASE ALSO ATTEND the Forest Plan meeting/open house Tuesday, March 17, from 5:30 - 7:30, at the Flathead Forest Supervisor’s Office, 650 Wolfpack Way, west of Costco and Glacier High School! While we handle the legal stuff, YOUR VOICE IS ABSOLUTELY NECESSARY TO SHIFT THE POLITICS IN FAVOR OF QUIET RECREATION, FISH AND WILDLIFE! We’ll issue several more alerts over the next two months as we dig deeper into the new proposed Flathead Forest Plan!